Art in Love? What does that mean? 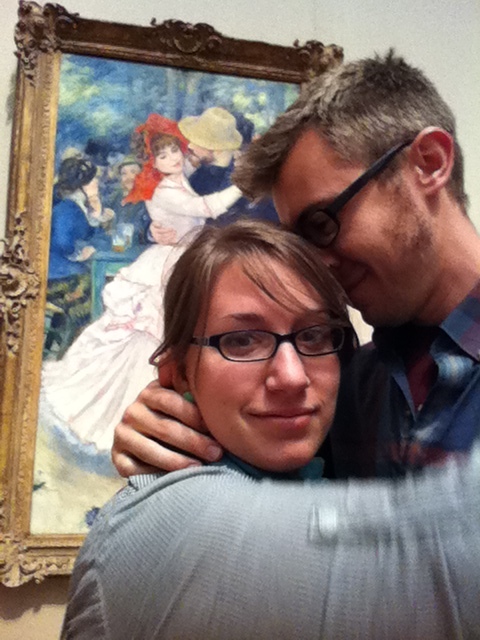 For us, Jeremy and Liz Grant, the phrase “art in love” has a lot of meaning. We’ll go into more depth about each aspect of what it means in the posts we write, as well as what we hope this blog will be, but to begin with, “art in love” has to do with us. Who are Jeremy and Liz Grant? We are a recently married artist couple– in fact, our marriage will be two weeks old this Saturday. Liz Grant (or Elizabeth Charlotte Grant, as she’d like to be known professionally ;)) is a writer of creative non-fiction, the genre of such greats as Annie Dillard, E. B. White, and David Sedaris (check out Liz’s old website here). She loves visual art and even paints, designs, collages, and takes photographs from time to time, but just for fun. She sings to herself in the car, enjoys to cook creatively, and is thrilled to be remodeling and decorating a new house with Jeremy. What is “art in love”? Art in love is, first of all, about us, Jeremy and Liz. We know that God has brought us together to love each other and to do art together. It’s hard to say what that will look like now, but we have high hopes for collaborative work in the future. We are madly in love with each other. We respect and admire each other’s art and vision for living. And we want to explore how we can be the best artists, lovers, and friends to and with one another. Second, art in love is about you. We love our friends, our families, and our audiences. We have been filled up with thankfulness and love for each other and for our God, and we have found that one of the best ways to say “I love you” is the artistic life. When an artist is paying attention to the beauty of the people in her life, then she will be more and more eager to represent that beauty she sees and to give it as a gift to her audience. She will be more eager to love her friends and family because of the beauty she is looking to find in them. Liz, in particular, finds that she rejoices over the people in her life more when she is seeking to tell good and beautiful stories. Third, art in love is about the beauty of this world. It has been a trend in recent years (or should I say that past two artistic and cultural movements of modernism and post-modernism?) to devalue the world and this life. The temptation for the artist has been to disregard audience altogether and to create art simply for himself. It has also been to find nothing in the world and nothing in his life that is beautiful. It is a choosing to ignore the beauty that is inherent in living. Yes, tragedy and sorrow are always with us. Yes, poverty and despair haunt our living. But our living is also accompanied with great joy, with great hope, with flowers and bees and cucumbers and yarn. We refuse a gift when we as artists, as people, turn our eyes away from the beauty of living and choose instead to focus on the sufferings of this life alone. That is simply untrue, and Jeremy and I desire our art to reflect the truth of living, with its hardships and beauties. And art in love is, most importantly, about God. We love God and know that He has given us artistic gifts for the sole purpose of worshipping Him out of love and thankfulness. We love to be His and we want to tell Him so in any way we can, and the best way we know how is through artistic expression. When we are loving Him, we will love everyone and everything else well: we will love each other, we will love you, we will love this world. So, I realize we aren’t beginning this blog with a light introduction, but we hope that our philosophy of art will draw you in. We want to highlight artists that we love and talk about artists that we don’t love and why. We want to point you to beauty at every turn. We want to display some of our own art here to encourage you in the artistic life and to give you as a gift. We want to allow other artist friends of ours to post on here as well– to hear their valuable thoughts on the arts and on living. And we want this to be a discussion place for artists to be able to explore why art is so important and why we must do art on top of all the other necessities of living (such as grocery shopping, doing laundry, checking email, dusting table tops, and pulling up tenacious weeds–or maybe that’s just my week).